Last night (GMT) Apple put on it’s WWDC 2016 event, and as always we were watching with eagle eyes to see what new features and innovations Apple is planning to release this autumn. One of the featured demos for the newly titled macOS was ‘Universal Clipboard’. I wrote a post back in September 2015 wishing for such a feature and we mocked up how we saw the ideal implementation of this panning out. 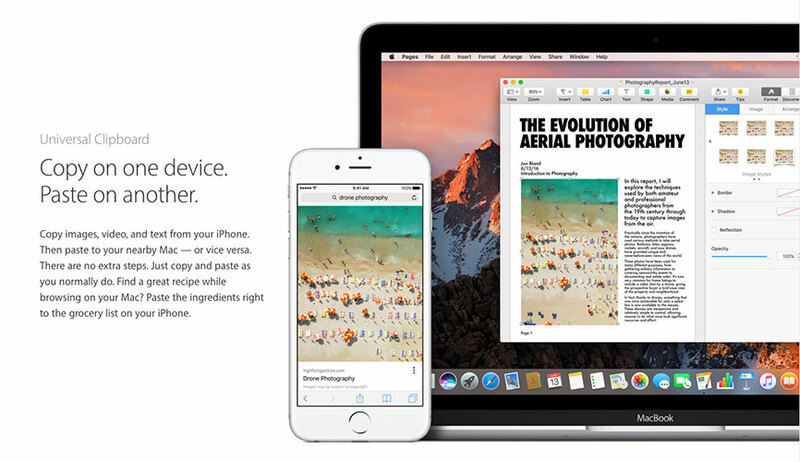 Apple’s implementation appears to be pretty simple; there is a shared clipboard with no visibility of what you are pasting – you just copy on one device and the copied item is available on another device for pasting. I also noted that it only works via proximity which suggests, like handoff, it uses a bluetooth handshake and you likely also need to be logged into the same Apple ID on both devices. 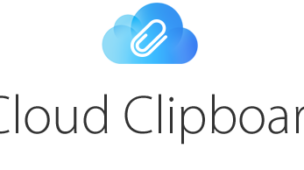 In our solution we envisioned being able to manage the clipboard more actively and choose from a history of recent items, much like the App Copied which was released shortly after we published our ideas. 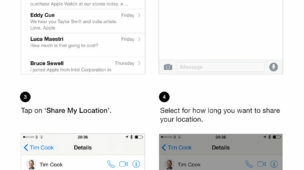 I guess that Apple wanted to keep this as simple as possible (as is the Apple way), and the addition of a proximity handshake removes the complication of say someone else using a device in another location (e.g. : at home, while you are at work) and creating unpredictable paste results for the user. But equally we’d like to have seen something more functional that would say allow us to use the paste board at a scratch pad that can be accessed at any time, for example to retrieve a link that you copied yesterday. I guess they see this as being more in the domain of notes, hand-off, reading list or bookmarks and just keep copy & paste effectively the same but work across devices. What we do hope is that this feature also works between iPhone & iPad and is not exclusive between Mac & an iOS device – something we felt important in our iCloud Clipboard concept. 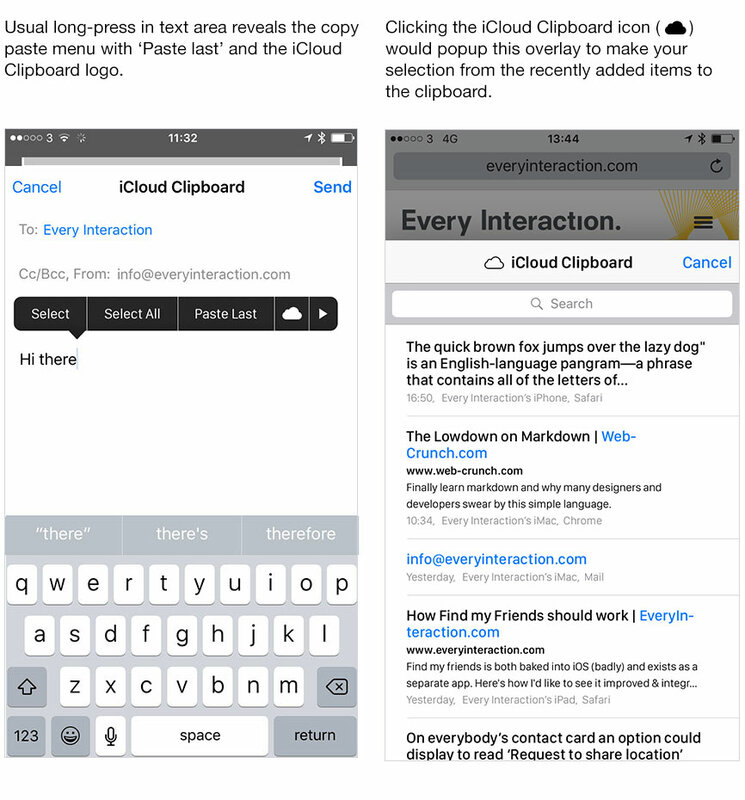 It doesn’t seem that Apple has completely sherlocked Copied or the other apps that perform a similar function, so we still see a place in the world for such apps to exist – giving users more powerful clipboard management functionality. Our concept was closer to how these clipboard management Apps turned out but was more tightly integrated into the OS itself in a way that only Apple could do. Great to see the fundamentals of our ideas put into practice, and we all look forward to the increased efficiencies that this and many of the other features announced will bring. During John Gruber’s Talk Show live, Craig Federighi talked about some more details for the Universal Clipboard, reinforcing that this is a proximity based feature, also revealing there is a timeout element. This confirms that bluetooth is involved, perhaps wifi, and we assume the last copied piece of content from another device will only be available for pasting for a few minutes, after which the clipboard content reverts to last copied data on the local device. Looking forward to trying this in person soon. Jump to timestamp 1h 12m. The Talk Show Live From WWDC 2016 with John Gruber, Phil Schiller and Craig Federighi.